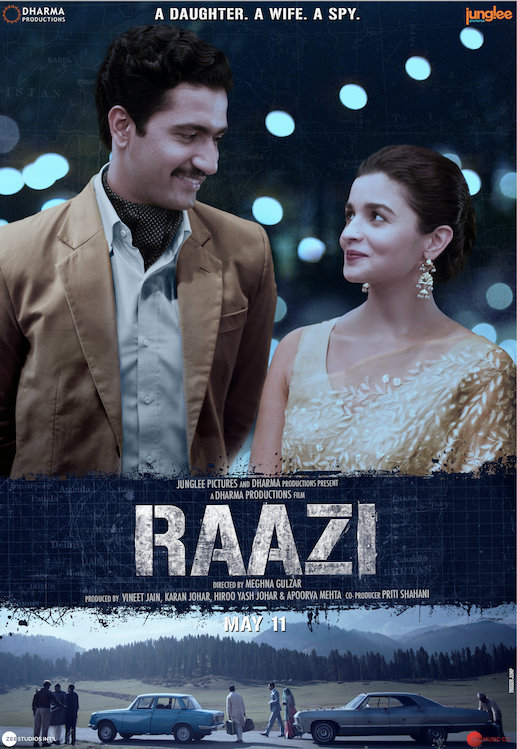 On the 11th of May, Dharma productions comes together with Junglee pictures to present Raazi, starring Alia Bhatt and Vicky Kaushal. Based upon the book “Calling Sehmat” by Harinder Sikka, it is a true story of the journey of an ordinary Indian girl, in extraordinary circumstances. Meghna Gulzar takes the director’s chair and to do the story justice lyrics are by her father (the legend himself) Gulzar and the music is provided by a well-experienced group in Shankar, Ehsaan and Loy. The album itself is fully contextual as these legends have always made the story their base point. As the title song, Raazi is required to give an essence of power, mystery and the sound of a journeyman (or woman in this case). Gulzar gives the powerful tagline “Laga de dao par dil, agar dil raazi hai” in a way he has done so many times for so many films over so many years. Similarly, the music also seems to be diving back into the past for inspiration, taking the best bits of great SD Burman’s works for great female heroines. Light strings and a drum give a strong beat and also are used to stir the audience’s hearts. Even when just spoken the lyrics get the audience ready for what is to come but Shankar Ehsaan and Loy in using Arijit Singh to sing them, find a way to take them to the next level as an experience. The story itself seems to be book-ended by two songs called Ae Watan. One is sung by Arijit Singh, one by Sunidhi Chauhan, each in themselves pure patriotism sung by pure singers. The background music isn’t much, giving these accomplished singers the spotlight. Drums and a string instrument or two, aim to fill the well of pride in the patriotic efforts of our main character and these two fine singers, each bring ‘junoon’ with their lion-like voices. They are ably backed by an appropriate chorus of voices. For Arijit an adult group has been tasked with allowing him to soar but catching him when he lands. For Sunidhi a group of children; a vocal sense of hope, to leave the audience with pride and tears in their eyes. Gulzar using the power of words gives these songs lyrics to melt the staunchest critics with “Kurban meri jaan tujhpe, shaad rahe tu” and “Zindagi shama ki surat, ho khudiya mere”. Gulzar has never been afraid to push the boundaries of language and often reaches for words audiences may not understand straight away, but puts them into context so they can be felt by any patriot or lover of music and poetry. Dilbaro is a point of inflection within the film as it plays the role of wedding bidai song and gives this album a personal feel. It used to be said that every girl must marry and when they marry they must leave their fathers’ house forever to never return. When it is considered that post-marriage Sehmat would be moving to post-war Pakistan, this is actually likely. Harshdeep Kaur and Vibha Saraf are asked to give the ambiance of sadness as Alia sees her groom, completes the ceremonial rituals and leaves with him, leaving behind a household she would have known since birth. Some Urdu lyrics mixed in with traditional Muslim wedding instruments give a solemn base to what is a very good song even if it is meant to be depressing in nature. Some hope is provided by Shankar Mahadevan singing some more fine Gulzar lyrics but overall the audience is asked to realise “Faslein jo kaati jayein, ugti nahin hai”. To sum up this album, we need to think about it in the film. ‘Ae Watan’ (male) will be early on, a sort of training video montage. ‘Dilbaro’ will follow with the wedding that takes Sehmat away from her home. Finally, ‘Ae Watan’ (female) might be used at the end to bring hope to future generations. The lyrics of course are epic pieces of writing from a leading poet and storyteller. Nothing here that wouldn’t be expected of such well known names of Bollywood. Based on the setting of the film, and it being what we believe is more background score full of patriotic love for India this album gets a very strong rating. However, if you are someone looking for some good songs which might stir you when you are down, then this album may not be for you.